Teens Making a Difference in our Community! Your Gifts Are Needed on Sunday! 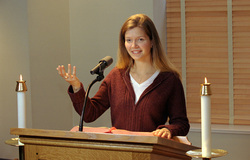 All high school teens are invited to become liturgical ministers at IHM. We need Eucharistic Ministers, Lectors, Greeters, Ushers and Musicians/Vocalists. We provide training. Call Margie Hynes at 330-793-1553. You can also email them at jmmhynes@zoominternet.net. Click here to take the pledge! Break the silence! Stop the violence! 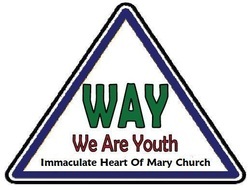 Take a Look Some Typical Youth Ministry Activities at IHM! The phrase, "Dress for Success", usually refers to dressing in a way that will make you successful. But did you know that some of our clothing choices make the lives of other people very difficult? Sometime people, including children, live on less than $1.00 per day so we can buy clothes at really low prices. They also work in very dangerous working environments and some even suffer abuse at the hands of violent managers. These situations will exist for as long as we continue to purchase the clothes that make the owners of these facilities rich while keeping the workers trapped in poverty. Most of the time, people are bullied because of looks, body shape, or race. But there's a deeper reason. It's fear or insecurity in the bully that is closer to the root cause. Most bullying stops when a peer steps in and defends the person being bullied. How can you respond when you see a post on social media that degrades someone in your school? How can you respond when you see someone being bullied in school or anywhere else? CLICK HERE for more facts about bullying. Got questions about faith and life? Click the button on the right to get information about lots of topics! 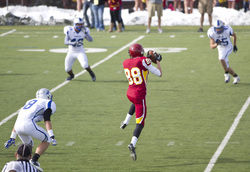 This thoughtful article will make you wonder about how to integrate your faith into your athleticism.